President Sepp Blatter has been cleared by FIFA’s ethics committee which has been holding a hearing into claims of bribery implicating Jack Warner and Mohamed Bin Hammam who will now both be suspended and investigated. FIFA HAS THIS afternoon announced that executive committee members Mohamed bin Hammam and Jack Warner are to be suspended pending a full investigation by its ethics committee. But the football governing body’s president Sepp Blatter will not be investigated and has been cleared of any wrongdoing by FIFA. Sepp Blatter will now stand for re-election as president this Wednesday unopposed after bin Hamman earlier withdrew his presidential bid in order to deal with accusations he had arranged bribes for up to 25 presidential voters on a campaign visit to the Caribbean. Blatter and FIFA Vice President Jack Warner were also accused of corruption. Warner, along with bin Hamman, will now be investigated in full regarding the bribery allegations. Bin Hammam, a Qatari who leads Asia’s soccer confederation, and Warner, a FIFA vice president from Trinidad, will now face a full FIFA inquiry. If found guilty, they could be expelled from FIFA and banned from all soccer activity. The ethics commission said there was sufficient evidence to further investigate allegations that bin Hammam and Warner offered $40,000 bribes to delegates at a Caribbean soccer association meeting May 10-11 in Trinidad. The payments were allegedly made to secure votes for bin Hammam in his campaign to unseat Blatter as the head of FIFA. The evidence was submitted to the governing body by American executive committee member Chuck Blazer. Incumbent president Sepp Blatter has been cleared and will now stand in a one candidate election this Wednesday, 1 June. 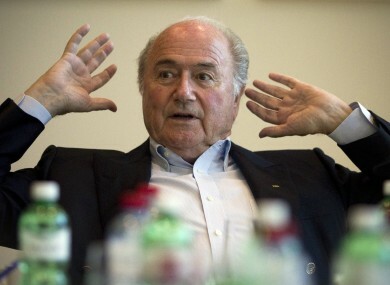 Email “FIFA suspends Warner and Bin Hammam pending investigation but Blatter is cleared”. Feedback on “FIFA suspends Warner and Bin Hammam pending investigation but Blatter is cleared”.